Power Of Mirantic is (now) an all-female symphonic power metal band from Surabaya, East Java in Indonesia which has released two solid full length records so far. On the first effort The Conscience, singer Dwi Fatmawati, lead guitarist Annisa Wulandari, and bassist Eva Safithri were supported by male musicians Putra Antono on guitars and Ikmal Mukti on drums. All members were in their early twenties back in 2011. This debut release is performed with a very unique passion and great musicianship despite poorer production and some mediocre tracks here and there. The largely instrumental opener and title features off-putting Asian islander-folk chants, emotional spoken word passages, and a massive use of artificial piano sounds and string sections. The cinematic opening becomes more metal when fast drums and beefy riffs kick in. Two minutes into the song, one realizes that one is dealing with a melodic power metal band and not some weird, experimental folk group. However, this is probably already the heaviest track on the record. As most Asian power metal bands, Power Of Mirantic are rather influenced by European power and symphonic metal. Instrumentally, an obvious influence is Nightwish, for example, while the vocals are probably overall closer to Edenbridge and Seraphim, as well as several pop and world music acts like Enigma, Loreena McKennitt, and Mike Oldfield. While the opening song has some interesting elements, it drags on for far too long, and “I Will Not Die Again” is the song that has to prove that this band is worth some attention. In fact, the second track is amongst the strongest songs of the album. Apart from the expectedly grand (if cheesy) orchestration, the fast riffs and drum play, the pumping mid-tempo bass work, and a number of harmonious guitar solos, I was surprised by several breaks in this complex track that headed for calmer and more reverent passages. The lead vocals don’t sound like most exchangeable female-fronted symphonic power metal acts, which feature high pitched operatic vocals, and give the band its own identity. As a matter of fact, while the band’s songwriting isn’t top notch, I have rarely heard such an enchanting voice with so much potential, and this somehow reduces all the obvious flaws that this debut release might have. I’m extremely curious to follow the future development of this gifted band and especially its outstanding singer. This entire album sounds very dreamy and peaceful without being boring and dull. The classic-souding keyboard orchestration, the melodic mid-tempo guitar, and the very feminine vocal performance meet enough powerful riffs and vivid drum play to build up a rather balanced sound, as seen in the perfectly entitled “Touch To Your Soul”. “Dream Of Love” comes around with calming sounds of the ocean, acoustic guitars, soft percussion, and soaring vocals that remind me of profound pop music of the eighties in the key of Sandra, for example. This song doesn’t have anything to do with metal music whatsoever, but it manages to touch my soul. This stripped-down piece of genius really manages to calm me, and makes me feel in harmony with the world. It’s a very soft song and yet so incredibly powerful. This is my secret highlight of the record, and I’m impressed that the band came around with such a refreshing change. 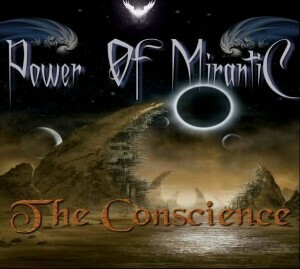 If you are interested in more spiritual female-fronted symphonic power metal and don’t mind some calm orchestrations influenced by new age, pop, and world music in general, I can warmly recommend you Power Of Mirantic’s debut release The Conscience. Take a break from your challenging everyday life and get on an appeasing, exotic, and religious trip to Indonesia.